Photo taken in Jl.Antasari at 4 PM, flood everywhere, we were stuck in the same street for 3 hours. 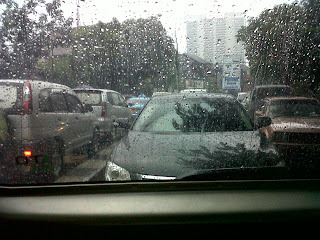 Yesterday, the traffic in Jakarta was like hell! Flood almost in the main streets and caused huge traffic jam until midnight. My plans to give tutorial, then gym, then meeting old friend at FX were all canceled. Traffic was totally a huge gridlock!! For 45 minutes we didn't move a single inch. Took us nearly 2 hours for distance just 1 km. Many sedan cars pull over, because of the flood. In the car, we tried to make the best of it. We sang, we played games, and thought about positive things. We didn't make it home, the traffic was so bad, my sister couldn't drive any further. We checked in to the nearest small hotel and checked out 4 am. What a night and what an experience...surely unforgettable. PS : When I read the newspaper this morning, there was an earthquake in Sumatra, a volcanic mountain in Jogjakarta is going to erupt soon,many have been evacuated and it happened yesterday the same time when almost all Jakartans stucked in traffic. And somehow...I'm grateful..I'm still luckier..
How Can I Resist Burger King?